Oil Painting Medic: What is best for Glazing Techniques Oil Paints or Alkyds? What is best for Glazing Techniques Oil Paints or Alkyds? Applying oil paint in layers or glazes is great for achieving detail and depth in color, as the effects are perfected as each paint layer is applied. But as oil paint dries slowly, alkyd paints might be preferred for its rapid drying rate. But what are the pros and cons of using glazing technique with oil paints or alkyds? Art mediums are defined by the vehicle in which the ground pigment is suspended, or in other words, its carrier. The ground pigment remains the same, but its carrier gives the paint different properties. Linseed oil (or safflower for pale colors) is the carrier for oil paint, but alkyd, a synthetic resin is the carrier alkyd paints. As alkyds dry more quickly than oils, alkyds might be the preferred medium for glazing in quick succession. Depending upon the pigment, the atmospheric conditions and the thickness of the paint, the following are on the average drying time of these different mediums. Traditional oil paints dry between 3 and 6 months throughout but will become touch-dry in 3 -6 days. Traditional oil paint mixed with alkyd medium takes between 1 – 2 days. Alkyd paints takes 1 – 2 days. As can be deducted here, oil paints can in fact be mixed with alkyd medium. Liquin is designed to alter the oil paint’s properties so that each layer of paint dries more quickly. Just place a few drops alongside your colors on the palette and mix in to no more than 1 part per 4. Liquin takes the gloss from the oil paint, creating a matte finish. This perhaps causes some confusion over the difference between oil paint and alkyd. Some term alkyds as ‘alkyd oil paints’, where alkyd is not an oil, but a synthetic resin that can be mixed with oil True, in the aforementioned example, it can be termed as alkyd oil paint, as the two are mixed together, but alkyd itself is not an oil. Alkyd paint is by nature fairly translucent and fast-drying, ideal for applying a quick succession of glazes onto a painting. However, alkyds remain workable for a day or more, allowing the artist time to manipulate the paint in one sitting. This would not be possible with other painting mediums, such as acrylic or watercolors which take a few minutes to dry. This makes alkyds ideal for glazing techniques. However, I personally find oil paints offer more flexibility when it comes to applying glazes, as alkyd mediums can be added to it anyway. Oils are also more widely available and have a wider range of colors. In most cases, it is not imperative that the painting dries rapidly unless I need to complete a commission by a certain date. Alkyd Paints or Oil Paints? Alkyd paints are designed to suit a painting technique known as glazing, which is the application of translucent layers of paint. This is because alkyd is itself a fast drying medium. However, alkyd can also be added to oil paint to create similar properties. 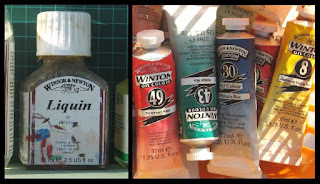 Liquin for instance can be added to oils to increase the drying time of oil paint, add translucency and kill its gloss. As oil paints are more widely available than alkyds and present a wider range of colors, opting for a set of oils with a jar of Liquin might be the logical answer. However, using alkyds alone are worth exploring to get a comparison. If the artist wishes to get on with the painting without having to add Liquin to gain a certain consistency and color transparency, then alkyd paints may prove more convenient.